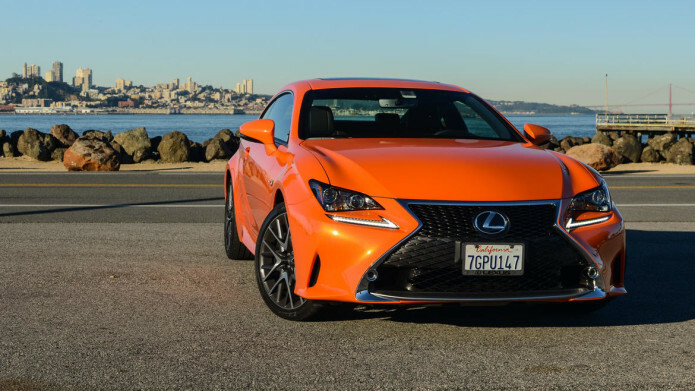 When you’re driving a bright orange Lexus RC 350 F SPORT, you quickly realize two things. First, that even when you’re in laid-back San Francisco, people are going to stare, even if they’ll try to make it look like they’re not interested. Second, that nobody is going to let you out of junctions or to merge in their lane (though they’ll often match your speed, just ahead or behind of you, so that they can peer at the badge; Lexus is still more associated with sensible – maybe staid – sedans than outlandishly swoopy coupes). Like the RC 350 F SPORT itself, relationships on the road are complicated. In an odd case of timing, I’d picked up the RC on my way back from the airport, having flown into San Francisco from the New York Auto Show. There, one of the highlights of the show was the new Lexus RX, probably the most important model in the company’s line-up when it comes to the US since it alone accounts for more than 1-in-3 of all sales. With only the vaguest of teaser images out there, the question was whether Lexus would stay the course on its aggressive L-Finesse design language, or take a more sober route for its cash-cow SUV. I admit, I thought Lexus would cop out on the RX, the risk of turning off its perhaps conservative bread & butter buyers deemed too great to produce another distinctive design in the vein of the NX, the RC, and even the IS. Consider me – and most people I talked to – pleasantly surprised to see that the Japanese firm stuck to its guns instead. Next to the RC, however, even the new RX looks grown-up and fairly restrained. Admittedly the Molten Pearl paint job of my review car is nowhere near discrete, but even in more sober finishes the styling is bold. Lexus’ love-it-or-hate-it spindle grille leads the way, bulging forward eagerly as its chromed lower edges flare out broadly, center pinched by squinting headlamp clusters and L-shaped LED running lights. The long hood leads sinuously over the swollen wheel arches, and there’s a fairly restrained splash of chrome to highlight things like the curve of the C-pillar. At the rear, the influence of Lexus’ LFA supercar is perhaps most evident. Narrow at the trunk lid with its small kick of an integrated spoiler, then broadening down to the wide rear bumper and its distinctive strakes and gills, it’s meaty and solid. The big chromed tail pipes help push the corners out visually, giving it a solid stance. Not everybody I spoke to liked it, and I think the orange certainly shares some of the blame for making the RC more polarizing than it needs to be. Still, as someone who likes Lexus’ bolder designs, I grew increasingly fond of both styling and color as my time with the car went on. At the same time, though, there’s a surprise there too. It’s easy to design a car that wows from the outside; it’s less straightforward making that same car usable every day. Climb into the RC – low, but not embarrassingly so when you drop into the bucket seats – and there’s a surprising lack of compromise despite the looks. Visibility is solid, with a decent view out of the rear glass, while the side mirrors – though they might not look out of place externally – giving a broad view of the road behind, unlike the narrow examples some rival coupes sport. Still, with the edges of the car out of sight, ticking the $500 parking sensor option seems like a sensible precaution at the bare minimum, and there’s a good argument for the $1,530 Navigation upgrade which, among its tech, includes a reversing camera. Lexus’ cabin is well constructed and for the most part well equipped. The seats are, after a little adjusting – 10-way power on the driver’s side, and 8-way on the passenger’s – both incredibly supportive and comfortable, and the leather feels great. The F SPORT package – more on which in a moment – adds heating and cooling to them, too. Interestingly, rather than starting with foam and then stretching the hide over it, Lexus makes the leather first and then injects foam, so that there are no wrinkles or creases. The result is a design that almost resembles a flexible carapace, with none of the wonky fit to the detailing you might find in other cars. Driver ergonomics are good, too. The chunky-rimmed wheel pulls out close – motorized on the F SPORT – and the paddle shifters fall neatly under your fingertips. Lexus’ aluminum-covered pedals are accompanied by a useful rest for your left foot (there’s no manual option), while the leather arm rest in the center console is well placed for your elbow. In short, while the outside might scream animal, the RC 350 F SPORT feels more like a grand tourer once you’re onboard. Both people in the front get plenty of comfort, as you’d expect from a Lexus, though the rear seats are close to vestigial. At 5’8 – and with the driver’s seat positioned to suit – my knees were pressed in tightly when I squeezed into the rear. Think kids or compact friends, then, or just use it as extra stowage on top of the 10.4 cu.ft trunk, which proved easily capacious enough for a week’s grocery shopping (and can be extended by virtue of the 60/40 rear seat split). If there’s a downside, it’s that it lacks the same sense of drama as the exterior. In fact, the similarities between the RC’s dashboard and that of the IS or the NX are all too obvious, and while the plastics are high-quality and the switchgear easily stabbed-at and pleasingly damped, I’d have preferred something more distinguished from a sedan or crossover. The paddles click easily, but they’re plastic not metal, and where those in rival coupes snap like a rifle bolt, in the Lexus it’s an altogether more restrained affair. The dashboard is well laid out, certainly, and its stacked contouring pleasing to the eye, but everything – down to the analog clock – feels far too close to what you’d get in the brand’s more sedate cars. As with other F SPORT models in Lexus’ line-up, there are no engine changes involved in the performance badging. Instead, your $3,985 gets you a combination of aesthetics and electronic tuning. On the outside, there’s a new front bumper and the spindle grille is different, while 19-inch F SPORT wheels provide a suitably moody contrast with their smoked finish against the orange paint job. The fog lamps, with their glitzy chrome surround, are in fact a $410 extra in their own right. Inside, meanwhile, there are special leather F SPORT seats – both heated and ventilated – and a perforated leather wheel, along with aluminum pedals. The only performance tweaks are the inclusion of Adaptive Variable Suspension (AVS) and a SPORT S+ mode on top of the regular Sport setting. If you want the Variable Gear Ratio Steering, that’s another $1,900. Those drivers on the hunt for more power will find that Lexus will happily sell them the RC F, the lunatic version of the RC. It may have a shorter name but, courtesy of a naturally-aspirated 5.0 liter V8, its 467 HP cuts the 0-60 mph time to 4.4 seconds and pushes the car to a 168 mph top-end, not to mention with an engine soundtrack as delicious as that of thesadly-retired Lexus IS F.
It’s not to say the RC 350 is underpowered, but the 306 HP and 277 lb-ft of torque it takes from its naturally-aspirated 3.5-liter V6 puts it safely in the midst of its rivals from BMW, Mercedes-Benz, and Cadillac. After all, for the price it’s up against cars like BMW’s 435i Coupe, not the M4. Altogether, it’s good for a 5.8 second 0-60 mph run, and a top speed of 143 mph. As standard it’s rear-wheel drive, though Lexus offers all-wheel drive as a $2,235 option. Check that box, however, and you lose the eight-speed auto transmission, since the AWD car gets a six-speed instead. Lexus has plenty to boast about in its shifter electronics. Okay, it might not be the true manual a keen driver desires – not, maybe, something somebody in Lexus’ target audience will especially care about – but slap the stubby, easily-gripped stick into “Manual” mode and downshifts apparently take place in a tenth of a second. The RC’s ever-watchful brain takes things like cornering forces into account when deciding when to shift, too, attempting to predict things like when the driver will want to hop back onto the gas after aggressive braking. F SPORT’s Sport+ mode is the setting to aim for if you want alacrity, particularly when you’ve got the Variable Gear Ratio Steering (VGRS). Gear changes are quicker and the gas pedal more sensitive, while the suspension gets tauter. VGRS adjusts how much turning effort is required depending on driving style and speed, and also gets more aggressive in Sport+; in contrast, the regular Sport setting felt a little louder, though not much more eager, than the Normal mode. What’s astonishing is, despite the RC being a Frankenplatform of three different cars – GS at the front, IS C in the middle, and IS at the back, all fettled together with extra bracing and sturdier laser screw welds – and its 3,894 lb curb weight, it’s ridiculously stable on the road. That pays dividends whether you’re on the highway, around town, or throwing the RC at some more entertaining roads. The freeway into San Francisco from the airport is hardly the smoothest example of road surfacing, but the Lexus soaked up the bumps without jumping or shuddering like you might expect from a sports car. Once I got into the city, I flicked into Sport+ mode and felt the car hunker down over the rapid hills and dips that make San Francisco such a challenge for lesser models. Admittedly, I slowed a little coming out of steeply-inclined intersections, though that was more out of a surfeit of caution for the RC’s fairly low front spoiler than concern over the road itself. The absence of wallow and that poise in corners – clearly capable of handling more than the three-hundred-and-change horsepower the RC 350 F SPORT has to play with – is nowhere more evident than when you get onto back roads. Pushing the coupe hard through the winding roads that thread you through Redwood glades further down the peninsula, I never felt like the Lexus was anything less than sure-footed. While I’m sure the AWD version is even more adept in wintery conditions, the climate never forced me to poke the “Snow” button but I feel pretty safe in predicting that even the RWD car would feel reassuringly safe. In fact, it might all be a little too proficient. Lexus has crafted a ridiculously technically adapt coupe, but in doing so it may have ironed out some of the personality that buyers in the segment might traditionally be looking for. Like with the LFA before it, the goal of an everyday sports car – something you can drive on the track just as readily as you drive to the office or the grocery store – has seen Lexus err on the side of “proficient” rather than “pulse-raising”. The economy figures fall in line, too. According to the EPA, the Lexus will do 19 mpg in the city and 28 mpg on the highway, for 22 mpg combined. In my own mixed driving I saw closer to 19.5 mpg. Lexus generally doesn’t stint on the gadgetry and the RC 350 F SPORT comes with a fair amount of tech installed, though my review car had a few options ticked too. Standard is Lexus Enform Remote and the Premium Display Audio System, offering HD radio, MP3, USB, CD, and SiriusXM. The orange monster had the Navigation System Package added, a $1,530 option including voice-controlled directions which actually did a surprisingly good job of handling my British accent for setting addresses. It also includes more Bluetooth functionality, and Lexus Enform apps, which include things like Bing search, iHeartRadio, Pandora, Yelp, and Facebook from your phone. If you can stomach $2,610 then Lexus will fit its Mark Levinson package. Everything you got with the Navigation setup, but a 17-speaker surround sound audio system too. Lexus made the switch from its finicky joystick controller to a trackpad in the NX last year, and it’s that which (optionally on the Navigation and Mark Levinson trims) navigates the infotainment system on the RC. It supports swipes and taps, and has adjustable haptic feedback that not only buzzes your fingertip when you make a selection, but when you slide across an actionable button, too. I much prefer it to the old system, though I’m not convinced by the placement; it feels too close to the armrest, and so you have to force your elbow back between the seats in order to use it comfortably. Enform is beginning to look a little dated now, especially given the higher-resolution graphics and animations other luxury car makers are experimenting with. The 7-inch display atop the RC’s center console is serviceable but hardly segment-leading; Lexus clearly understands that, given the new RX has a vast 12.3-inch widescreen panel. I’m not quite sure how it could be jammed into the RC 350’s dashboard, but I’d like to see them try. Personally, I wish you could swap out the $1,100 moonroof option in the test car for the $500 dynamic cruise control, that uses radars in the grille to automatically adjust speed according to surrounding traffic (and can help you with braking power if you suddenly have to slow down – the RC’s brakes proved to be reliably grippy, and even after some more spirited driving showed no sign of fading). Unfortunately, the moonroof option is mandatory for F SPORT cars. The biggest party trick, however, is the F SPORT’s sliding tachometer. Normally, the digital instrumentation in the driver’s binnacle is dominated by a central circular screen, putting engine speed around the edge while speed, gear, and driving mode are in the center. Hit a button on the wheel, however, and that circle motors across to the right, revealing a rectangular display with more in-depth information on things like economy, radio station or currently-playing media, navigation instructions, incoming Bluetooth calls, and more. Lexus says it’s to distill some of the LFA’s singular focus to its more affordable little brother. Frankly, though, it’s really just a slice of much-needed playfulness and drama that I wish Lexus had extended to elsewhere in the cabin. Lexus has always been a brand you choose with your head as much as with your heart, and while the company has pushed its sporting dynamics in recent cars, you’ll undoubtedly find more engaging driving machines for the $53k this particular RC 350 F SPORT costs. From that you could extrapolate that the Lexus falls short, though I’m of the opinion that the RC’s cool proficiency is intentional, not necessarily a shortfall. Not everybody wants a seat-of-their-pants ride every time they’re driving; not everybody has a spouse content to bump and jitter on sports suspension whenever you’re going to pick up groceries. Had Lexus called the RC a grand tourer, its personality would be easier to understand. I spent several hours behind the wheel, on both highways and back roads, and climbed out without any of the tiredness a more dramatic alternative might lead to. For some that will be a turn-off; others will see the usability and the competitive pricing as part and parcel of its overall appeal. The Lexus RC 350 F SPORT does what it’s designed to do very, very well: just be sure you understand exactly what that is before you buy.